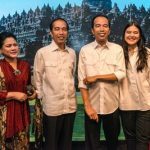 Madame Tussauds Hong Kong today announced the official launch of the world-first figure of Indonesian President Joko Widodo. President Joko Widodo and his family unveil the wax figure on a private visit. For the first time in history, a world leader visits and unveils the figure in person at Madame Tussauds Hong Kong, the fame attraction at The Peak. During the visit, President Joko Widodo and First Lady Iriana Joko Widodo take photos with President Soekarno, the former President of Indonesia. Dressed in his trademark white shirt and rolled up sleeves, President Joko Widodo’s figure stands against a large LED screen backdrop, displaying pictures of infrastructure, tourism and people in Indonesia. “When people come to visit “me”, they can also enjoy the beautiful places in Indonesia.” President Joko Widodo explained. Born in 1961 in Surakarta (also known as Solo), central Java, Indonesia, President Joko Widodo was a governor of Jakarta from 2012 – 2014. He was elected the 7th President of Indonesia in October, 2014. Apart from implementing Jakarta Health Card (KJS) and Jakarta Smart Card (JKP) to citizens, President Joko Widodo is committed to enhance Indonesia’s infrastructure and achieve target during his term in office. In 2014, he was listed by Fortune as one of the ‘The World’s 50 Greatest Leaders’ and featured on the international cover of TIME Magazine’s October issue. President Joko Widodo surprised and said his figure is 99.9% the same. To ensure the figure is truly captured his resemblance, President Joko Widodo spent hours sitting with Madame Tussauds team last October to take over 200 measurements, identify exact eye colour and hair colour. Mr. President generously donated the clothes that will be worn by his figure to create an exact likeness. He and his family were pleased and surprised with the finished figure when they come and meet President’s wax double today. “It’s 99.9% the same!” President Joko Widodo and First Lady Iriana Joko Widodo said. President Joko Widodo feels happy and satisfied with his figure. 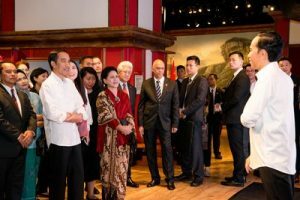 Moreover, President Joko Widodo shows interest in knowing the importance of lighting and backdrop to a wax figure. President Joko Widodo feels satisfied with his figure. President Joko Widodo will join other world leaders like President Soekarno, the former President of Indonesia, as well as prominent political leader such as Mahatma Ghandi in the Historical and National Heroes area.